Aston Villa must not suffer the same fate as Wigan by being relegated as FA Cup winners, says boss Tim Sherwood. Villa are four points above the drop zone in the Premier League, but have secured a cup final against Arsenal at Wembley on 30 May. Wigan won the FA Cup in 2013 by beating Manchester City but also dropped out of the top flight in the same season. "We want to avoid that and it is good to use as an example," said Sherwood, who takes his side to City on Saturday. "We certainly won't be enjoying that trip to Wembley if we are not a Premier League club at that time." Villa were 18th in the league and five points above the bottom when Sherwood took over as manager from Paul Lambert in February. 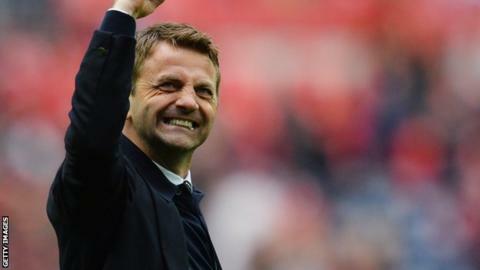 Sherwood has since guided the club up to 15th in the table and on Sunday they reached their first FA Cup final in 15 years with a 2-1 win over Liverpool. "We obviously want to win the FA Cup and nothing is going to get in the way of that," added the former Spurs boss. "But we definitely still need to be in the league. We will use everything we can to warn them against complacency."